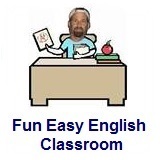 ﻿ Fun Easy English - new classroom free online classes english language lessons speaking listening writing reading november. This month in the classroom celebrate Thanksgiving. Learn all about this holiday. Grammar focus continues with punctuation. November 3 - Daylight Saving Time ends - Test your reading comprehension about Daylight Saving Time ends. November 11 - Veterans Day - Test your reading comprehension about Veterans Day. November 19 - World Toilet Day - Test your reading comprehension about World Toilet Day. 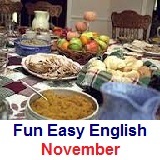 November 28 - Thanksgiving Day - Test your reading comprehension about Thanksgiving Day. November 29 - Black Friday - Test your reading comprehension about Black Friday.